I'd been somewhat burnt out on 2E, so to amuse myself, a while back I started making decks based around (or at least using) each of the different Kira Neryses in the game. I'd played this one at my last 2E tournament, months ago, and had fun with it, so I took it off the shelf to use again (with just a couple of minor tweaks). I considered going on to build a deck around the next Kira in line, "Rescuer," but that seems like a very weak card by comparison. At least, I am at a loss as to what to do with it. I felt like I would be in a reasonable place against things like battle (only one space mission, hopefully done early with minimal crew); the new Dominion homeworld (bonus points available); heavy kill dilemmas (low-cost recursion of dead all-stars); standard mission solvers (I like my dilemma pile). I was hoping not to see decks with a ton of dial-a-skill interrupts, which I did not have much defense against and would be rough against my skill-based dilemma pile. Conversely, I had some skill holes and no ability to manufacture a skill not in my discard pile, so I would have a difficult time against a dilemma pile targeting those. Matt's Ferengi deck, which I lost to, had both (Rule #33 to kill Rapid Progress/Counterinsurgency; and Unwanted Guests/Pawn Against Pawn to hammer my lack of Acquisition). Yes, looking at my record I have played Bajoran at the last 9 tournaments. So I feel pretty comfortable with them. Recently I've been using the new Bajor HQ for the Orbs, especially Prophecy and Change to switch out 1-costers for 5-costers from the discard pile. In this version I ended up not using them as much since Kira was doing the heavy lifting bringing in high-cost folks. Also, I can't get enough of the Denorios Belt mission. I was getting really tired of going on WNOHGB trips, so the last several decks I've made use this as my only space mission. I try to go out early as possible with a micro-team there. One new thing I did stumble upon this time was using Winn Adami to preempt an opponent with Dukat, Pah-wraith Puppet - Metron Arena protects personnel, but the excess verbs that I'd normally leave in the discard pile for Orb Transport Vessel were at risk. So instead I had Winn consume Orb and Prophet cards for the draws, which had the neat effect of offsetting some of the cost of Kira's discards. Next time I might set up that dynamic on purpose. The Orbs were mostly situational this time around, and I might not use them again in this particular build. Just Like Old Times is mostly there to be discarded for the Orb Transport Vessel, but it won me a game when I needed round-the-corner points to make up for using Kira Meru's ability. Porta's terrible attributes and 2-cost always make him a borderline choice, but once again his skill-gaining ability came in handy, letting me pass a Whispers in the Dark that I was almost sure I was going to fail. Kira Nerys, First Officer (obviously). Her ability can really churn out all-stars fast, and being able to draw up before discarding down to get just who you want improves selection too (both in who you play and what you want in your discard pile). Runner-up would be Mullibok - his unstoppable/unkillable ability has triggered many times. On the dilemma side, "Rapid Progress" is a great card for the skill-tracker, and a perfect fit for Bajorans in particular. Much more so since the (greatly appreciated) ruling that this type of dilemma does count as "requiring a skill." It speaks well of the game that 13 different versions of the same character could each have a place in a different style of deck. When I see a deck breach 70 cards or so, I immediately assume that it is a control or interference deck and start looking for the event destruction, interrupt prevention, engagement stuff, that sort of thing. After all, control and interference decks, by their very nature, have to be large. 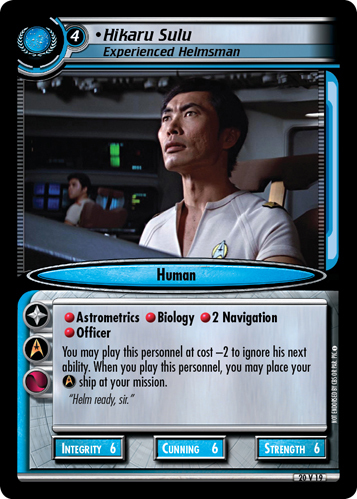 Every deck needs a bare minimum of personnel to be functional at mission solving - any small deck isn't going to have room for interference cards after you include the necessary personnel and interrupts. Then you need the card draw and other counter-gaining elements in order to even draw into those power cards... yeah, we're looking at a large deck if you want to mess with your opponent's plans. So, imagine my surprise when I didn't see those interfering elements in Thomas' deck. I look at a lot of decklists; it's really cool when I get surprised. 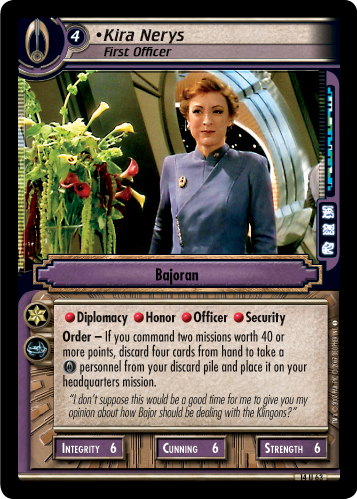 This Bajoran deck is not a control deck, it isn't an interference deck, it's a 100 card speed solver. The average draw deck cost is a sweet 2.07, and most of the non-ship 3+ cost cards won't even get played, they'll slip into play through Kira or the Orb of Prophecy and Change. You've got to draw into Kira, but in the place of those interference cards you'll find classic Bajoran personnel downloaders like Invocation of Kosst Amojan and Symbol of Devotion. 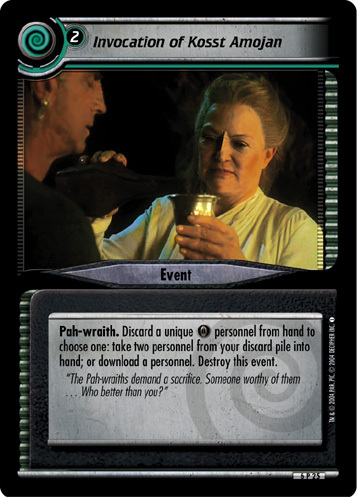 Bajorans are of course a natural choice for a plus-sized speed solver; a deck like this one has plenty of cards that are just going to end up in the discard pile, ripe for Spiritual Exploration shenanigans. 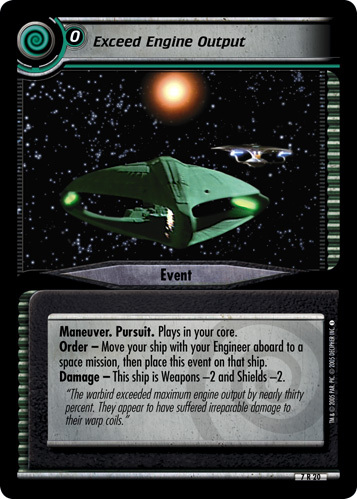 However, with decks like Romulan Discard out there, and with long games due to potent stall dilemma strategies, there's more and more reason to beef up that speed solver with some supplies for the long haul. Some games you may see less than a quarter of your deck (and wonder why the rest is there), but in other games you'll either be able to keep replenishing wave after wave of expendables or you'll have the resources to build up multiple crews. So I considers a few others, because like most events I started my deck choice pattern by looking at which achievements I still needed. I have a few decks built that I would HAVE to win with but they are weaker achievement decks, (like my thieves), so they're risky for a regional where most people "bring it" a bit more. I like to make sure I at least have a deck worth a play hit toward one of the x10 achievements. Ultimately, as I was scrolling through I realized that TOS was sitting at 9 plays and 4 wins, so a TOS deck would hit 10 plays no matter what; and if I could win with it I would finish off TOS for a while. It just so happened that I had a GREAT TOS deck sitting ready since I had played it in the last local regional. I added 2 cards I liked for the current meta and went with it. I did have some concern about playing Federation since our meta is VERY Moral Choice heavy but this deck was first dreamed up in its original version by MVB (Michael Van Breemen) and it was so rock solid that I figured I'd just weather the moral storm. One other reason I like this one was it had very slightly more space or planet only dilemmas in its dilemma pile than I normally run and as I was expecting the +cost to dual dilemma missions. I was hoping to face, mostly solvers... hoping to dodge battle since the primary plan involves stopping the Enterprise-B and parking it a turn early out at a space mission for the Field Studies. I expected to face multiple decks, possibly Dominion, playing the new +cost dual dilemma missions. I did face one, and there was at least one other there that day that I just never faced. I played it in our last regional, and have played against MVB playing his original version of it a lot. I've got a lot of experience with the deck, nothing new was learned that did not relate to the new cards I added. I added 2 Exceed Engine Outputs as tech against Crippling Strike... they FAR outperformed my expectations. I ended up never facing Dominion with Crippling Strike but in 3 of my 4 games EEO sped me up by at least one turn, in the 4th it would have as well BUT I never drew one despite going through at least 3/4 of my deck. EEO was the MVP by far in these games. It saved me a turn or two (in one game I used two of them) in every game I drew it, directly leading to me winning at least two of those games. The 3rd we will never know - it would have been close - if I could have stopped my opponent for another turn to get the extra turn I would have needed without EEO. The old MVP probably would have been Field Studies/Dyson Sphere, solving a mission for 45+15 points never facing dilemmas is nice. I got incredibly lucky in my game against MVB, I think overall he had the stronger deck, but between a bad start from him (mine was not great either but not as bad as his) and me getting JUST the right dilemmas a few times. For example, I was able to use Well Prepared Defenses as a one dilemma stop twice at his space mission because Donatra had only copy of a single skill needed, that saved my bacon. The core of the draw deck was taken from MVB and is a rock solid solver that is a LOT of fun to play. But TOS achievements are done now, so deck goes on to the shelf for me now. So, yes, this deck is nearly identical to the one Ken won with back in week 4, and I discussed it a fair bit there. The only change was the addition of two copies of Exceed Engine Output, and Ken's feedback pretty much covers how well that went. In a deck that is otherwise constrained in its movement (by the plodding Enterprise-B), the ability to suddenly appear at your space mission after picking up an additional crew can save a whole lot of time. This is a classic card that I haven't seen used much recently, and it always makes me happy to see it get a new chance to shine. Since I've already discussed this deck, and don't have many changes to talk about, I thought it might be useful to discuss how to tech against it. Sure, Ken says that he won't play it again, but it's a good exercise to look at a deck's weak points, especially a well-known one that might show up at a tournament near you. Fortunately, between Ken and Michael, this deck has been played a lot - at the World Championships alone, Michael played a full eleven games with it. He did accrue some losses, so what are the lessons we can glean? I mean, other than just be Neil Timmons. At Worlds, this deck lost to Voyager, two Romulan decks, and a Maquis deck twice. What's the common thread? Well, the Romulan decks (one Aid Legendary Civilization/Tragic Turn and one Discard) and the Maquis (stall) deck were all interference decks. This deck follows a pretty strict course, it should play the same way in just about every game. When another deck forces it to take another path (for example, by discarding the Enterprise-B before it can be played), then things start to fall apart. Of course, it isn't that simple; the personnel here are cheap enough and there are enough of them that they can also be used as cannon fodder for a boring old three mission win should the need arise. That is decidedly a worst-case scenario though. Interference decks aren't everyone's cup of tea though, what do you do then? Well, the other deck that beat this deck at worlds was Stefan Slaby's Voyager Deck, which is one that I'd classify as a control solver. It has some event prevention (handy against those Field Studies), but also has the capability of simply solving too fast through tricks like the Chakotay Twins. If you think you might be facing a deck like the one Ken used, it might be time to add some Grav-Plating Traps. Dukat, Pah-wraith Puppet is also a strong card to consider, as he can work on decreasing the value of the Dyson Sphere (though the deck has several tricks for getting cards in the discard pile on the turn of the Sphere solve). Be warned though, another Voyager Control Deck (this time piloted by Johannes) lost to Michael on that same day. Happy hunting! In Kazan, Russia, the Delphic Expanse Second Edition Regional drew eight players and was won by Nickolay Korotya. I usually go in chronological order for these reviews, but this deck was just posted today, and for reasons that will become clear shortly, I felt it would make more narrative sense for me to review it last. I wanted to play something new (for me) - and to win, too. This deck looked like it meets both of these objectives, so after thinking things over for some time I have picked it. As for considerations, I considered using my Relativity deck (decided that I'd rather play a new deck) and Romulans with new GQ-Stakoron missions (didn't have time to proper playtest it, sadly). I hoped to face decks with lots of cheap personnel - and I did indeed :) As for non-grata ones, I was mildly worried about any ship-destroying or heavy kill decks. I've played the first and only game with this 2-mission TOS the night before tournament. However, this deck's main idea is easy to grasp, and the deck is relatively easy to play. During the tournament, it performed mostly as expected. So, I learned mostly minor tweaks and stuff. As the last set was good for DS9/ES9, I decided to use 3 Moral Choices (usually I keep only 1 or 2) - thinking I will face a lot of Federation decks. As for usefulness, I was positively surprised by the effectiveness of Slightly Overbooked this time. As for last question, I think none of the cards were completely useless (I'd say Zero Hour was the least useful, but even it worked once). Obviously, I'd nominate U.S.S. 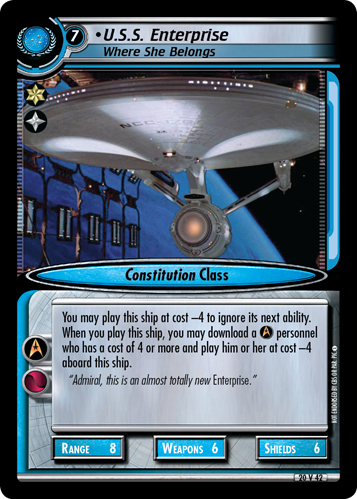 Enterprise, Where She Belongs - as it is really a great card for TOS (and one of the most memorable and well-known sci-fi ships, too). 2nd place goes to Slightly Overbooked – it performed flawlessly this tournament. Big thanks to Michael Van Breemen and Kenneth Tufts for the deck idea! All that commentary about how to tech against this deck just became a bit more relevant, huh? This TOS deck is truly a beast; all the benefits of the old Bajoran Rocketship dilemma avoidance decks, with the robust mission solving skill of TOS for those times when your best-laid plans fall apart. The deck can go well over 100 points even from just two missions with the B, Tallera, and a beefy discard pile fueled by Trellium-D. 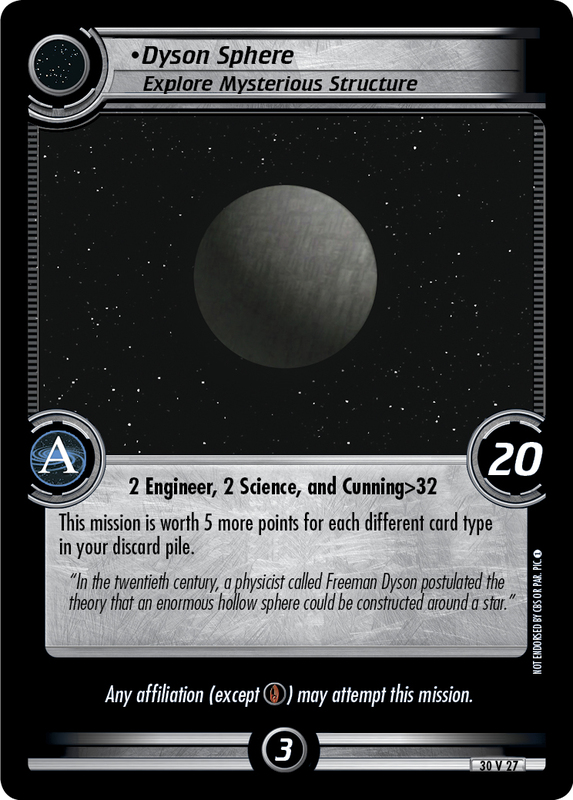 I believe I read a report somewhere of Michael Grav-Trapping his own event in order to put three different card types in his discard pile on the turn of a Dyson Sphere solve. I can't find it now though, so I think it is perhaps something someone else did with a deck using Dyson Sphere (perhaps Mike Harrington?). Still, it is a thing that could be done with this deck. Anyways, we've got just a few differences here again. We don't have the Exceed Engine Outputs that Tufts teched in this week, but instead there are a few more personnel and a The Manheim Effect. As I've noted in earlier weeks, Manheim is a powerful but underused card in a world where so many of the dilemmas we use can single-handedly shut down entire attempts. Use it to get back those Moral Choices and Issues of Trusts for later mission attempts - assuming you're facing a deck that actually faces dilemmas at two missions, unlike this one. The personnel added include the non-aligned version of Daniels, who includes among his six skills the rare Intelligence. Since the only mission type where you'll face a significant number of dilemmas is planet, it's good to be ready for those pesky Rogue Borg. Also present is the Allegiance version of Hikaru Sulu, who here fills much the same role as Exceed Engine Output. While he is normally a tech card against Where No One Has Gone Before, in this case, he's a different way to grant mobility to the finicky Enterprise-B. That's it for this week, see you next week with decks from Regionals in Texas and Ohio! Be sure to tune in to Daniel's Regional Rundown in the meantime.